Amy Webb is an American world - renowned futurist and author. She works as a professor at the NYU Stern School of Business and is also a founder of the Future Today Institute, which is focused on emerging technologies at the fringes and tracks them as they move in to the mainstream. Amy´s forecasts are often published in different media as the New York times, the Wall Street Journal, televisions channels and so on. Webb´s work was awarded several awards and honors like 2017 Thinkers50 RADAR Award or Washington Post Bestseller etc. (http://amywebb.io/bio ). Her third book ‘The signals are talking’ was the first best selling new book on Amazon and is the winner of the 2017 Axiom Business Book Award in Business Technology. In this book Amy Webb show us how to see and analyze real signals, their trends, directions and their velocity. By the narrative approach of telling stories Amy show us how to act in a correct way when doing forecasts. She says that if we want to succeed in today´s and future world we have to forecast. By proven and tested methodology we can create our preferred futures. At the beginning of the book the author says that future do not appear fully constructed over a while, but it is always the result of a longer process, which will occur gradually. It never appears in the mainstream but in some of points on the fringe of society. These points usually look unrelated or distant, but by time they fit into patterns, and then you can see the emerging trend. Trend which will move with future as a force made by human needs and technological development. These signals that show us a trend or a future trend are difficult to see or to find. Even if we see them we can misinterpret them. The author shows this misinterpreting on example of Research in motion company (RIM) and their product Blackberry. The „RIM“ company saw a new trend called „ a computer like phone technology“, so they came with a new product called blackberry. Blackberry proved to be a successful project anyone who was important had a Blackberry. The „RIM“ company has invested in the development of Blackberry instead of exploring future situation, future scenarios and demand. And they did a big and expensive mistake, they misinterpreted the trend. The new trend called smart phones – all computing in one device. They fell asleep on mainstream. The author says that our reptile brains often focus rather on more obvious facts like trendy things than how trend, or technology is shaping our organizations and so one. For example our focus on flying cars, which is not trend but just trendy, doesn´t show us that in few years we will be all flying in cars. Trend is technology development in transport, not necessary embodied by flying cars and not ending by constructing flying cars. Webb shows us a method of six steps that will help us to create a good foresight. These steps are „Find the fringe, Use CIPHER, Ask the right questions, Calculate the ETA(estimated trend arrival – where trends is along its trajectory), Create scenarios and strategies, Pressure – test“. She explains their meaning on examples one by one. Fringe is a place where people from different areas, for example scientists, technologists or artists are testing their hypotheses to achieve a new findings? Fringe can be an idea or thought that can look bizarre or as we in the history saw unethical, but it can show us new facts or a new potential future direction. A personal computer, or pocket- sized mobile phone could looked like madness or “mission impossible”, but still it moved from the fringe to the mainstream. Not everyone is a fringe thinker, but this ability is necessary for forecasting. We need to go further in thinking about the future. After you gather all raw data you have to categorize them into patterns and cipher them. The cipher it tool in helping us to see the relationships, or the direction of a trends. You can find your own cipher or you can follow the Author in using six model ciphers indicators. So you can consider motion and relations between patterns. And then you will see another interesting facts which will lead you to another step. „Asking right questions, dates and reality are changing“. Are trends that you still find trends, are there any new trends? Have you thought about it from different points of view? The author explain how to ask questions to improve our foresight. After that is devoting to the development of the trends. Webb is saying that trends are developing in some trajectory and speed, which is not linear. If we want to succeed we have to recognize both aspects and know when to take action. The author is also showing a formula for calculation the right timing of the trend. This aspect is also very important, it makes a difference from losing to winning as we can see on the example of two competitive companies which are Yahoo and Google. While Yahoo, who had ten-year head to start and far more capital to improve and create new technologies, did not pay attention to the right timing, Google was early to recognize and take the action. Google with its technologies came to the market in right time, the time when people was ready for it, while Yahoo was still waiting till it was too late. So Google win the rival race. When you have all the necessary information, you have to formulate your foresight. For that purpose the author recommended use of the „scenarios“. Yes, the scenarios is a term borrowed from Hollywood. The scenarios as in the Hollywood must be easy to follow. It is proven that, people are more in story telling, than in the literature of facts. So for our foresight we should use if/then pattern. For example if this happen, then we should do that.. And we should also follow scenario consents like optimistic, pragmatic, pessimistic and catastrophic because there will be always more scenarios that can happen than one. After establishing of scenarios we have to do one more thing, and that is pressure testing. So as a conscientious foresighter you should follow the F.U.T.U.R.E. test. Test your foresight in consents of Foundation, unique, track, urgent, recalibrate, and extensible. So you have to answer questions like do I have support from key stakeholders, do I have enough time and money, do I have right strategy.. (foundation). In concept of unique does my action offers unique proposition, or is it clear to my customers? For track – will I have reliable data, or am I able to find and follow trend and measure the outcomes? Does my trend strategy communicate a sense of urgency? Questions of recalibrate will be like how I will evolve my strategy, how I can get enough money, or plan new strategy? How extensible is my trend strategy? Can it accommodate new trend easily? As an example we can see a Chinese bot Xiaoice and an American version Tay. They were both constructed like a teen girl who can learn from us and speak with us by social networks. While Xiaoice worked very well in her country, she was nice and polite, Tay in her homeland USA showed herself as a very rude girl with terrible opinions. Why it happened? Because of different homeland policies. And Americans would know that if they had done their F.U.T.U.R.E. test. If they tried to answer the above-mentioned questions, they would find out where a mistake might be. What is very important is to realize that future is an endless cycle. What happens in the future is being created just now. If we realize that fact we can not just predict or foresight what will happen but we can also take into account and do things to achieve our preferable future. So the future can be just like the way we do it. The author is offering us a way how can we all achieve the best preferred way for our better future. Storytelling makes this book very readable. And also by putting an interesting examples makes the book very instructive. 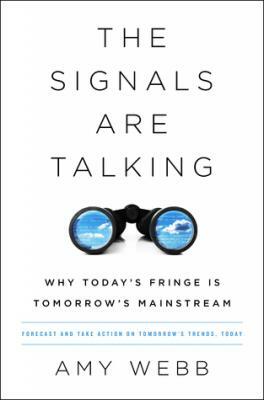 „The signals are talking“ should be a very useful guide for every foresighter. Sometimes the book can be very descriptive for the uninitiated but even if you are not a foresighter, the book may be interesting and stimulating for you. It can show you ways how to reach the desired future. At least it offer a different perspective over thinking about the future. So if you have desired goal, book can be a helpful in realizing your preferred vision. Maybe by publishing it the author makes a step to her preferable future.